AleaSoft, November 8, 2018. AleaSoft regards as very unrealistic the electricity market price scenarios that feature a very low retribution for photovoltaic production in the next ten years. Why forecasting the market price captured by the photovoltaic at 10 €/MWh on average for all 2030 is not realistic? It is clear that with such a price, no technology is profitable. The markets are designed to find the balance between the price paid by consumers and the price received by producers and that is beneficial for both. 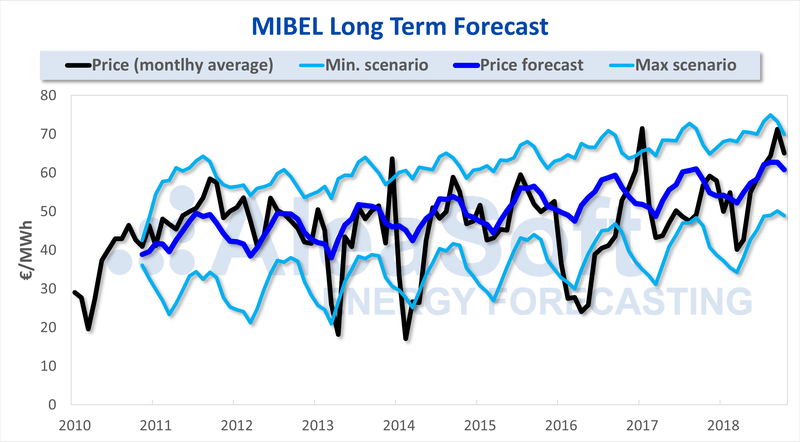 One need only look the long-term forecast of the MIBEL price that AleaSoft made at the end of 2010. 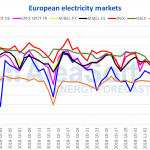 Since then, the price of the Iberian market has been oscillating due to the specific conditions of each year, but the average annual price has remained around an equilibrium point between 45 and 55 €/MWh. Even being relatively elastic and being able to alternate periods with high prices that favour producers and periods with low prices that favour consumers, a price far from the equilibrium point of the market is not sustainable at the long term, at least for one of the two parts. Therefore, it is not realistic for a technology to receive on average a price as low as 10 €/MWh for a whole year, for example. In the long term, the market self-regulates. That is to say, if the price during sunny hours was systematically so low, the demand, especially the new demand arising from the electrification of transport, with the charge of the batteries, would tend to concentrate in those hours, increasing at the same time the price. In the same way, with such low prices, energy export would increase to the maximum available capacity of the interconnection with France that can grow by 6 GW more until 2030, which, in turn, would increase the price again. We must not forget that technologies such as reversible hydroelectric pumping stations and new storage technologies such as batteries will move the demand from the most expensive hours to the cheapest ones, flattening the price curve and preventing the price from dropping. On the other hand, with such pessimistic forecasts, the investment in photovoltaic parks would be greatly reduced, so that photovoltaics could not reduce the price in those hours either. In addition, we must bear in mind that the behaviour of agents when making offers in the market depends on the price, and will not offer systematically at a price with which they cannot cover their costs and recover the investment. There is already an example with the zero prices that were usually registered in the Iberian market until the beginning of 2014. Since then, they have not appeared again because the wind energy parks changed their strategy when it comes to bidding. The average of the 100 hours with the lowest price in 2013 and 2014 was zero €/MWh, in 2015 it rose to 8.37 €/MWh, 3.89 €/MWh in 2016, and in 2017 it reached 14.53 €/MWh. It is true that the photovoltaic technology has a not very flexible time structure of production, it can only produce electricity during sunny hours, which does not allow it to participate strategically in the market and has to settle for the price registered during the central hours of the day. It is clear that the increase in photovoltaic power will decrease the price in the hours when it produces more electricity, so that its price weighting factor will be less than one, and the price it will receive will be lower than the average market price. But AleaSoft forecasts estimate that this decrease in the perceived price compared to the average market price cannot be so low in the next 20 years. The medium and long-term price forecasts made by AleaSoft provide a very different picture. 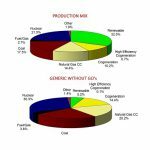 The current situation of the market of high prices pushed by the price of CO2 emissions rights and fossil fuels for the generation of electricity (gas and coal), and the imminent installation of new renewable power, suggest that in the next years the price will have a tendency to recede. Although the specific behaviour of each year will depend on the weather conditions encountered: wind, rain and temperatures. In the long term, the upward trend in the price of gas due to the global increase in demand, and the commitments of European countries to close coal-fires thermal power plants and to reduce nuclear power, contradict that the average price received by photovoltaics for a whole year may go down to 10 €/MWh. Perhaps, the models used have been of fundamental variables type with a fixed demand that has not taken into account the market equilibrium. If the flexibility of the demand against the hourly prices is not taken into account, one can get unlikely results like this one.